Properties in Ricobayo Dam average 4.4 out of 5 stars. Property 13: WIFI, cleaning included, BICYCLES. 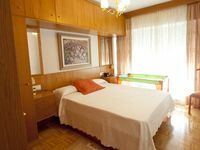 This apartment is ideally suited for walking around the old city of Zamora. Only a ten minute walk from the cathedral and castle! Shopping is close and there are lots of bars and restaurants to choose from in the neighbourhood. The host was extremely attentive and helpful with touring advice. I recommend! Both Marta and Luisa were very kind with us at all times. The house is very spacious and nicely furnished including the kitchen and patio. The village with the supermarket and other services is like 10 min driving. The area around the house is very quite, perfect for relaxing. We just had one issue, no internet the whole weekend and very bad phone signal, apparently there was a storm the same day we arrived and the cable company couldn't come during our staying. Luisa kindly offered her house to use the wifi but it didn't make sense to do that at all. We asked for a discount for the issue but they didn't accepted it, just an apology. In summary, nice house, nice host, nice place for relaxing, but an issue with the service paid for that we considered it should be discounted.